Research in our laboratory is focused towards understanding the molecular and signaling mechanisms that regulate the acquisition and maintenance of skeletal muscle mass. For past five years, we have been investigating the proximal signaling mechanisms that regulate skeletal muscle atrophy, regeneration, and muscle hypertrophy. We are also investigating signaling mechanisms which regulate self-renewal and differentiation of satellite cells in myogenic lineage. Moreover, we are studying the pathophysiological mechanisms which mediate the disease progression in muscular dystrophy. Using animal models, we also study molecular mechanisms regulating skeletal muscle wasting during cancer cachexia. We use several cutting-edge biochemistry, molecular biology, and physiology techniques including tissue-specific transgenic and knockout mice, microarray, quantitative real-time PCR, RNA interference, viral vectors, primary mouse muscle cell cultures, flow cytometry, mass spectrometry, muscle contraction studies, and various immunohistochemical and morphometric methods in our ongoing research. Key words: Skeletal muscle atrophy/wasting, hypertrophy, cancer cachexia, myogenesis, muscle regeneration, satellite stem cells, myoblast fusion, muscle signaling, muscular dystrophy, fibrosis, NF-kappaB, MAPK, Akt/mTOR, TWEAK, TRAF6, TAK1, MyD88, ER Stress, unfolded protein response, and Rhabdomyosarcoma. 1.TWEAK-Fn14 signaling in skeletal muscle. One of the major areas of our research is to understand the trigging mechanisms and initial signaling events which lead to the loss of skeletal muscle in different catabolic conditions. Our studies have led to the identification of TWEAK-Fn14 system as a major mediator of skeletal muscle wasting. We have also found that TWEAK inhibits the self-renewal of satellite cells and regeneration of myofibers upon injury. We are now investigating the molecular mechanisms including the role of various microRNAs in TWEAK-induced muscle wasting. In addition, we are investigating how TWEAK-Fn14 signaling in skeletal muscle regulates whole body metabolism, obesity, and insulin signaling. 2. Signaling mechanisms in skeletal muscle development and regeneration. Myogenesis is a multi-step process that is required not only for embryonic development but also for postnatal growth and repair of injured myofibers. Impairment in myogenesis is a critical determinant of skeletal muscle-wasting in chronic disease states and also for development of rhabdomyosarcoma in children. We are investigating signaling mechanisms which regulate the survival, proliferation, and differentiation of muscle progenitor cells (satellite cells) during muscle development and in response to injury. We are focusing to investigate the role of various TNF receptor-associated factors (TRAFs) and their interacting proteins such as TAK1 and Myd88 in regenerative myogenesis. Moreover, we are interested to understanding the role of various inflammatory mediators in skeletal muscle regeneration and/or degeneration in vivo. 3. Pathophysiological mechanisms in muscular dystrophy. Another important area of research in our laboratory is to understand the pathophysiological mechanisms and to identify novel molecules/drugs which can be used for the treatment of muscular dystrophy patients. In the past, we have reported aberrant regulation of several cell signaling pathways and transcription factors in skeletal muscle of dystrophin-deficient mdx mice. The present focus of our research is to investigate the mechanisms leading to extracellular matrix (ECM) breakdown and insufficient muscle regeneration in animal models of muscular dystrophy with special emphasis on the role of matrix metalloproteinases (MMPs). Our recent studies have suggested that the expression of several MMPs is aberrantly regulated in dystrophic muscle of mdx mice and inhibition of MMPs using pharmacological or genetic approaches attenuates ECM abnormalities and disease progression in mdx mice. We are developing novel genetic mouse models to further investigate the role and the mechanism of action of various ECM proteins and signaling pathways in the pathogenesis of muscular dystrophy. Hindi SM, Sato S, Xiong G, Bohnert KR, Gibb AA, Gallot YS, McMillan JD, Hill BG, Uchida S, and Kumar A (2018) TAK1 regulates skeletal muscle mass and mitochondrial function. Journal of Clinical Investigation Insight (JCI Insight), 3 (3):e98441. Hindi SM, Shin J, Gallot YS, Straughn AR, Simionescu-Bankston A, Hindi L, Xiong G, Friedland RP, and Kumar A (2017). MyD88 promotes myoblast fusion in a cell-autonomous manner. Nature Communications 8: 1624. doi: 10.1038/s41467-017-01866-w.
Bohnert KR, Gallot YS, Sato S, Xiong G, Hindi SM, and Kumar A (2016). Inhibition of ER stress and unfolding protein response pathways cause skeletal muscle wasting during cancer cachexia. FASEB Journal 30: 3053-3068. Hindi SM and Kumar A (2016) TRAF6 regulates satellite stem cell self-renewal and function during regenerative myogenesis. Journal of Clinical Investigation 126: 151-168. Ogura Y, Hindi SM, Sato S, Xiong G, Akira S, and Kumar A (2015) TAK1 modulates satellite stem cell homeostasis and skeletal muscle repair. Nature Communications 6:10123 doi: 10.1038/ncomms10123. Sato S, Ogura Y, Tajrishi MM, and Kumar A (2015) Elevated levels of TWEAK in skeletal muscle promote visceral obesity, insulin resistance, and metabolic dysfunction in mice. FASEB Journal 29:988-1002. Tajrishi MM, Shin J, Hetman M, and Kumar A (2014) DNA methyltransferase 3a and mitogen-activated protein kinase signaling regulate the expression of fibroblast growth factor-inducible 14 (Fn14) during denervation-induced skeletal muscle atrophy. Journal of Biological Chemistry 289:19985-19999. Hindi SM, Mishra V, Bhatnagar S, Tajrishi MM, Ogura Y, Yan Z, Burkly LC, Zheng TS, and Kumar A (2014). Regulatory circuitry of TWEAK-Fn14 system and PGC-1α in skeletal muscle atrophy program. FASEB Journal 28:1398-1411. Hindi SM, Sato S, Choi Y, and Kumar A (2014) Distinct roles of TRAF6 at early and late stages of muscle pathology in the mdx model of Duchenne muscular dystrophy. Human Molecular Genetics 23:1492-1505. 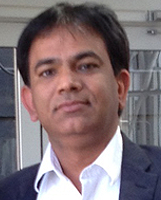 Hindi SM, Tajrishi M, and Kumar A (2013). Signaling mechanisms in mammalian myoblast fusion. Science Signaling 6: re2 (1-9pp). Ogura Y, Mishra V, Hindi SM, Kuang S, and Kumar A (2013). Proinflammatory cytokine tumor necrosis factor (TNF)-like weak inducer of apoptosis (TWEAK) suppresses satellite cell self-renewal through inversely modulating Notch and NF-κB signaling pathways. Journal of Biological Chemistry 288:35159-35169. Shin J, Tajrishi MM, Ogura Y, and Kumar A (2013). Wasting mechanisms in muscular dystrophy. International Journal of Biochemistry & Cell Biology 45:2266-2279. Hindi SM, Paul PK, Dahiya S, Bhatnagar S, Mishra V, Choi Y, and Kumar A (2012). Reciprocal interaction between TRAF6 and Notch Signaling regulates regeneration of adult myofibers upon injury. Molecular and Cellular Biology 32:4833-4845. Paul PK, Bhatnagar S, Mishra V, Srivastava S, Darnay BG, Choi Y, and Kumar A (2012). The E3 ubiquitin ligase TRAF6 intercedes in starvation-induced skeletal muscle atrophy through multiple mechanisms. Molecular and Cellular Biology 32:1248-59. Dahiya S, Bhatnagar S, Hindi SM, Jiang C, Paul PK, Kuang S, and Kumar A (2011) Elevated levels of active matrix metalloproteinase-9 cause hypertrophy in skeletal muscle of normal and dystrophin-deficient mdx mice. Human Molecular Genetics 20:4345-4359. Paul PK, Gupta SK, Bhatnagar S, Panguluri SK, Darnay BG, Choi Y, and Kumar A (2010). Targeted ablation of TRAF6 inhibits skeletal muscle wasting in mice. Journal of Cell Biology 191:1395-1411. Mittal A, Bhatnagar S, Kumar, A., Lach-Trifilieff E, Wauters S, Li H, Makonchuk DY, Glass DJ, and Kumar A (2010) The TWEAK-Fn14 system is a critical regulator of denervation-induced skeletal muscle atrophy in mice. Journal of Cell Biology 188:833-849. Li H, Mittal A, Makonchuk DY, Bhatnagar S, and Kumar A (2009) Matrix metalloproteinase-9 inhibition ameliorates pathogenesis and improves skeletal muscle regeneration in muscular dystrophy. Human Molecular Genetics 18:2584-2598. Li H, Malhotra S, and Kumar A (2008) Nuclear factor-kappa B signaling in skeletal muscle atrophy. Journal of Molecular Medicine 86:1113-1126.